Let’s continue with last week’s topic, finding a good home for your website. In my last article, I explained why it’s important you select the right hosting for your site. I also introduced three broad categories of hosting: shared, VPS, and dedicated. If you missed the article feel free to go here to read it now. But of course, there’s much more to consider when selecting a hosting company and a plan, and that’s what this article is about. Even though there are many companies offering hosting, not two offer the same product or level of service. That’s why it’s difficult to compare hosting products and services; it’s like comparing apples to oranges. It’s crucial you do your homework. Be prepared to spend some time to get the information needed to make an informed decision! What you know about technology and your willingness to deal with it impacts your choice of hosting. For this article, I’m going to assume you don’t know much about hosting or technology. So, are you ready to choose your home on the web? Good, here’s your first step: decide what you need and want from a web host. While it’s tempting to go with hosting that’s been recommended, it may not be the best fit for what you need. Every person and business has specific requirements when it comes to web hosting. That’s why you want to identify what you need and then look for a hosting plan that’s the best match for you. Think about it; you wouldn’t buy a 1-Bedroom condo when you have five children, right? The same applies to buying hosting. You want to match your needs with the best hosting plan. After all, you don’t want to run out of space right after setting up your hosting account or pay for features and services you’ll never use. what is the primary purpose of my site? Will it be my practice website, my blog, e-commerce or affiliate site …? A basic blog, or even a practice website, will require far fewer resources than a full-fledged e-commerce site. how much content, articles, reports, or pages will I create? Will I have a lot of graphics or videos on my site? Will I have data or files to download for my visitors? Here are three metrics to consider: disk space, bandwidth, and memory. Disk space is simply the amount of disk space available so you can store files, programs, images, videos, etc. You need adequate space to store all your files and programs. The amount of disk space should be enough to allow for some growth. Bandwidth is a measure of the amount of traffic and data transferred between your site and your users. Every time someone accesses your site a certain amount of bandwidth is consumed, regardless if a file or video is downloaded or not. You need to have adequate bandwidth with your plan, so your site responds timely to user requests. A small or new site won’t eat up much bandwidth at first, but that will change as the site grows. There are hosting companies advertising “unlimited bandwidth” with some of their plans. Since you’re paying for bandwidth, the term unlimited is misleading. Nobody will give you truly unlimited bandwidth. The term “unmetered” is more accurate. When a company advertises unmetered, it means you’re free to use bandwidth” up to a certain limit as often as you’d like. While bandwidth is important for large sites and high traffic sites, it’s not as critical when first starting out; chances are, you won’t go over the limit. However, you still should know about bandwidth and what you’ll be paying for it. Memory, Ram, or Random Access Memory, is the amount of working space available to run your programs and applications. Every time you start a program or submit a query, data gets loaded into the memory on your web host. Memory is temporary storage space and different from disk storage space, which permanently stores your data and programs. If your hosting plan doesn’t come with enough memory, your site will be slow to respond. Again, when first starting out, memory may not be an issue; however, once your site grows it may affect site performance. who will manage my site, I or a third party? Think about this carefully. If you manage your own site, you may want to choose a company with lots of tutorials and training, so you can get up to speed. If someone else will manage everything for you, perhaps you want to choose a host they know and are comfortable with. These three questions will get you started with selecting a hosting plan for your website. And don’t worry if don’t have an answer to every question. There will be things you won’t be able to answer, and that’s ok. But it’s still important that you’ll know what’s involved with choosing a web host. What else should you know or ask before you choose a host? Since this could turn into a long list, I picked the most important questions to ask before deciding on a web host. What kind of support do they offer with their hosting plans? Is it email, chat, or phone support? As for myself, I work with a company (Siteground.com) offering all three types. Personally, I will shy away from a hosting company without phone support. There is nothing worse (of course there is…) than sitting in front of your screen frantically typing away explaining to someone that your site won’t come up. I think it must be the ultimate test of patience! How long do you have to wait until someone picks up the phone? Is it a few minutes or do you have to wait on hold for the next 50 minutes until someone comes on? At the same token, how long do you have to wait for an email or response to chat? Uptime refers to how often websites go down (are not accessible) and how quickly they come back online. You want numbers in the high 90s, preferably 99.x. How many sites can you host with a particular plan? Depending on the company and plan, you might go with a plan that gives you a single website only. Alternatively, you could go with a plan that gives you multiple websites. Since I talked about this earlier in the article, I won’t go over it again. Does the plan include backups of your site or will you need to do them yourself? Many of the more expensive plans include daily or weekly backups of your site. Does the host provide one-click WordPress installation? If you want to use WordPress for your website, it’s nice if your web host offers one-click WordPress installations instead of having to install it manually. SSL stands for secure socket layer. It’s a security technology used to establish an encrypted link for the secure transmission of data between a web host and a user, the client. Many companies offer free (or low fee), automatic installation of SSL certificates. This is something to look for, as Google is beginning to “punish” sites that don’t utilize an SSL. So you might as well start using an SSL from the get-go. As I said before, there are many hosting companies out there; some great, some good and some not so good. I suggest you choose a company with a solid track record, good reputation, and history. You don’t want to host your site with a company that started their business last week! Take out some time to read what other people say about the company. Are most happy with their service or do most complain? Remember Google is your friend here! While the above is not an exhaustive list, it will get you started and point you in the right direction. You noticed I didn’t mention the cost of hosting because I don’t think it should be the most important criteria. Overall you want to choose a hosting plan that is affordable, easy to use, caters to your requirements, and has great customer service. Make sure the plan you pick is more than adequate for accommodating all of your present needs. Most hosting companies offer upgrade plans if you do run out of bandwidth or disk space. Upgrading is a much better option than moving to a new host completely. Here is a short list of hosting companies we can recommend. Either one of our associates or we have hosted with the company in the past, or we’re hosting with them now. Feel free to start your search with any one of these companies; I don’t think you’ll be disappointed. Both Siteground and Bluehost offer plans ideal for people just getting started. They also have plans for bigger sites and more extensive resource needs. Liquidweb is an option well suited for bigger sites and more technology savvy users. 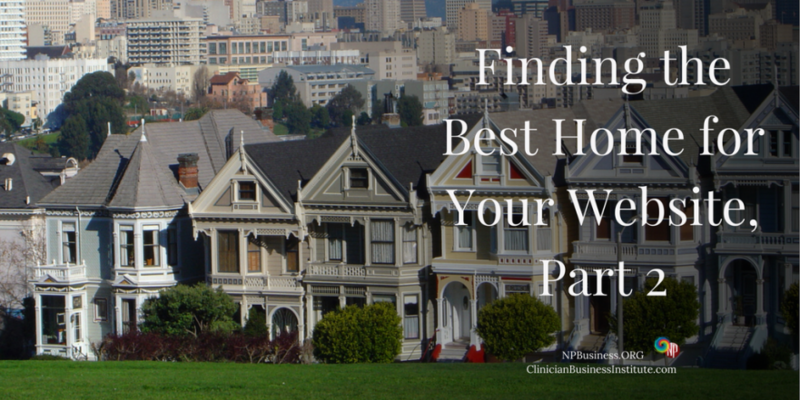 So now you have all the information you need to get started with finding the best host for your website. And in case you have any questions, just let us know. Leave your question or comments below and we’ll get back with you.